Cycling and mountain biking in Nepal is the best way to explore and discover the isolated and unfrequented areas of the beautiful country of Nepal. Once you set off on your Nepal bike tour, you will immediately be drawn in the fascinating mountain panorama of snowy peaks, breathtaking waterfalls, attractively carpeted grasslands, turquoise-tinted lakes, remarkable gorges, cascaded-flowing rivers and beautiful fruit orchids. The surreal Nepal landscape encompassed with sensational sceneries of formidable peaks gaping valleys, elevated passes, and high-raised glaciers, is truly a dream come true destination for adventure fanatics, offering them the thrill of a lifetime in the greatest sport they can wallow in. The panoramic and bumpy mountainous landscape offers bountiful opportunities for fervent bikers to satisfy their adrenaline impulse. Regardless of whether it is cross-country, downhill or pathway riding, whatever your cycling style may be, Nepal offers remarkable terrains to suit every rider’s desire. An hour, maybe two, day-long, or milt-day-long, the pick is yours. The biking route cuts across secluded villages and lush forest where you get a deeper understanding of the lifestyle and culture of the people residing in the remote area. 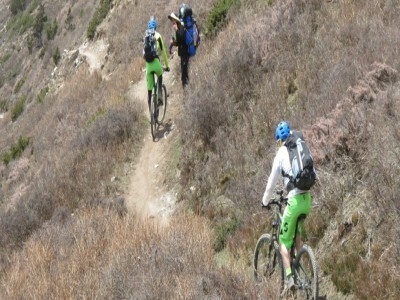 If you are planning a Nepal bike trip, there are plenty of mountain biking trail for the absolute biking adventure. The unforgiving biking trail around Annapurna course overflows with captivating beauty. Insightful Nepal bike tour around Kathmandu via the forested trails is especially suited for the beginner riders. 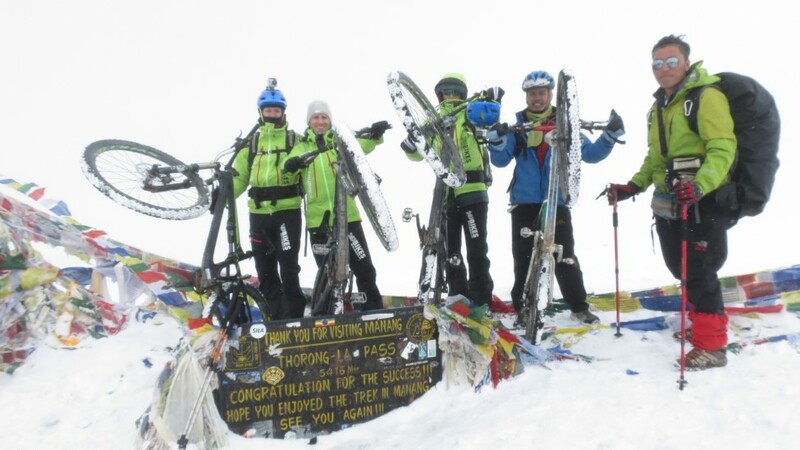 Langtang biking routes and Upper Mustang is among the most challenging biking adventures. Satori Adventures offer an extensive selection of biking tours suited for all levels of fitness. We serve all biking connoisseur in Nepal. Satori Adventures ranks among the top mountain biking operators in Nepal, equipped with an extensive knowledge of the Himalayas as well as several other routes all over Nepal. 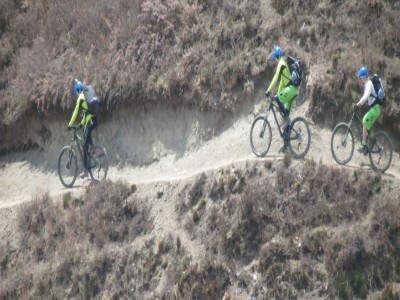 Backed by our years of experience and prowess in planning Nepal mountain bike tours, we guarantee you the most picturesque and testing biking trails depending on your level of expertise. The biking adventure tours are even more interesting and appealing with the incorporation of touring, homestay and experience of the local cuisine and culture. In addition, our team of expert members together with strong networks assists in making all the arrangements for procuring permissions and permits to access the restricted areas. November – January (winter): Most suitable time to ride in low altitude. May – July (summer): Best for riding the rain shadow area with higher altitude for example Mustang. If you do not mind the wetness and mud, it is also best for low altitude riding. August – October (autumn): Great for riding in all areas of Nepal, but especially best for high altitude riding. From a country bestowed with ancient history and the world’s tallest peaks, its combination of culture, color and world-class topography will leave you with enduring memories for life. Duration: 21 Days Elevation: (4450m/14597ft) Grade: Moderate Co-Ordinates: 28° 49′ 0″ N, 83° 52′ 15″ E Group Size: 01-10 persons per Group. Duration: 08 Days Elevation: (3800m/12465ft) Grade: Easy Co-Ordinates: 28° 49′ 0″ N, 83° 52′ 15″ E Group Size: 01-10 persons per Group. Duration: 08 Days Elevation: (2195/7200ft) Grade: easy Co-Ordinates: 27.7172° N, 85.3240° E Group Size: 01-10 persons per Group.